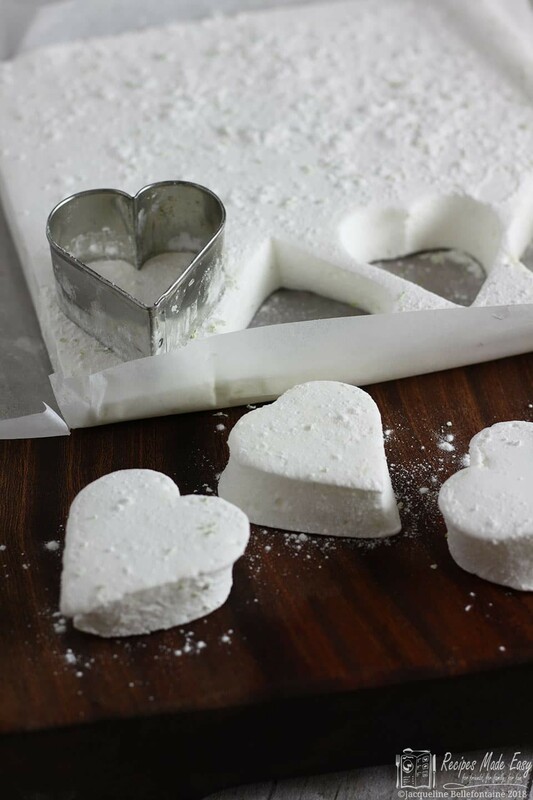 These gin and tonic marshmallows make a perfect gift for a gin loving friend or to share on Valentine’s day with that someone special. Fluffy marshmallows flavoured with gin and tonic, what’s not to love. It seems that the world is going mad for gin at the moment. Personally I don’t mind, it’s been one of my favourite drinks since the early 90’s. While I am happy to just drink gin and tonic, I don’t see why I shouldn’t join in the fun and use it as a flavouring too. A couple of years ago I worked on a part-work magazine called Something Sweet, published by De Agostini. It was one of my all time favourite jobs, developing chocolate and confectionery recipes and preparing them for photography. Over the 90 issues that made up the collection I developed several marshmallow recipes. I haven’t made them since and I thought it would be fun to revisit them. As I was thinking about flavours gin and tonic sprang to mind. I have stuck with the same basic method I used for the recipes I made for Something Sweet. It worked, so why change it. Then it was just a case of going to the kitchen and playing with flavours. Now, if you haven’t tasted homemade marshmallows then let me tell you, you are in for a treat. They are so much nicer than those mass produced ones you get in a bag. You know the ones, pink and white puffs with little flavour. When making marshmallows at home, I tend to make them and cut them into squares that are tossed in a mixture of icing sugar and cornflour. Cutting them out can be a bit sticky, but lightly oiling your knife will help, just use whatever cooking oil you have to hand and wipe clean frequently. Alternatively, keep cleaning the knife with hot water. 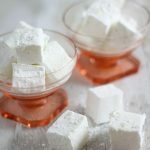 These gin and tonic marshmallows really are quite quick and easy to make, but you do need to allow enough time for them to set. This is a recipe for which you will need a thermometer because the sugar syrup has to be heated to the right temperature. You can use a sugar thermometer that clips onto the pan which are fairly inexpensive. I use a digital thermometer as they are the most accurate and I would recommend you get one. While a little more expensive they are more useful as not only are they great when making jam or confectionery, they also mean you never again have to overcook a piece of meat just to be on the safe side! 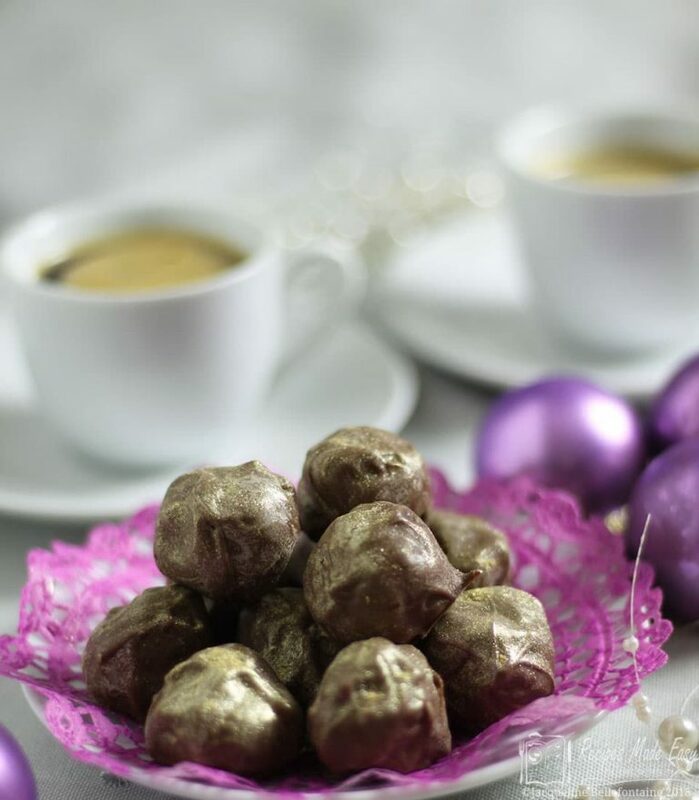 Because the sugar is boiled to a high temperature, you will need to be very careful. It is not a good idea to make them if you have young children around or are likely to be distracted. It should take about 5 minutes to reach the correct temperature. I often find when making a sugar syrup that it seems to stick on the same temperature for a while then suddenly shoots up several degrees very quickly, so stay with it and don’t be tempted to look away. Soft, squishy marshmallows flavoured with gin and tonic. Line a 20cm/8in shallow square cake tin with baking parchment and lightly oil. Place the gelatine leaves in a bowl of cold water to soak for 5 minutes. Place the egg white in a large grease-free icing bowl and get the whisk ready for when the sugar syrup is made. To make the syrup, place the tonic water in the saucepan and add the granulated sugar. Heat gently, stirring until the sugar dissolves. Once all the sugar has completely dissolved bring the sugar syrup to a boil and continue to boil without stirring until the temperature reaches 115°C/239°F. As soon as the sugar syrup reaches the correct temperature, remove from the heat. Lift the gelatine sheets out of the water and squeeze off the excess water then add to the syrup one at time, stirring well until dissolved. Then stir in the gin. Working quickly, whisk the egg whites until standing in stiff peaks, then with the whisk running on a low speed, very slowly whisk the hot syrup into the egg whites. Pour it in a thin and steady stream, trying to avoid hitting the beaters. When all the syrup has been added, add the lime zest and increase the speed of the mixer and continue whisking for about 8 to 10 minutes until you have a thick glossy mixture. The mixture will fall from the whisk in a slow ribbon like stream when it is ready. 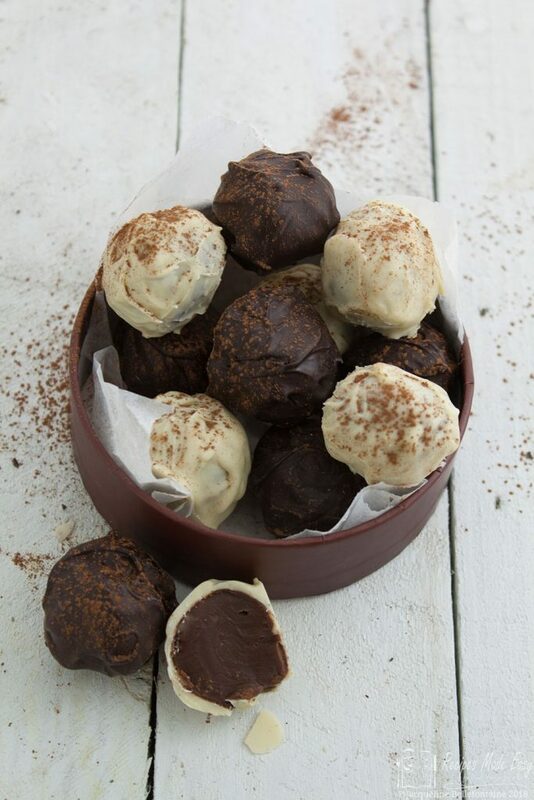 Pour into the prepared tin and leave in a cool place (not the fridge) for 4–6 hours until set and springy to the touch. Mix together the icing sugar and cornflour and dust the top of the marshmallow with the mixture. Turn out onto a board and carefully remove the parchment paper. Dust with a little more cornflour mixture and cut into squares. Gently toss the squares into the cornflour mixture and serve immediately or store in an airtight container in a cool place for 3 days. amazing! have only made homemade marshmallow once, and they were much better than shop bought. I think your gin and tonic ones would be very popular with my school mum chums! I agree much much better than shop bought ones, so much more flavour. These have certainly been popular with my friends. 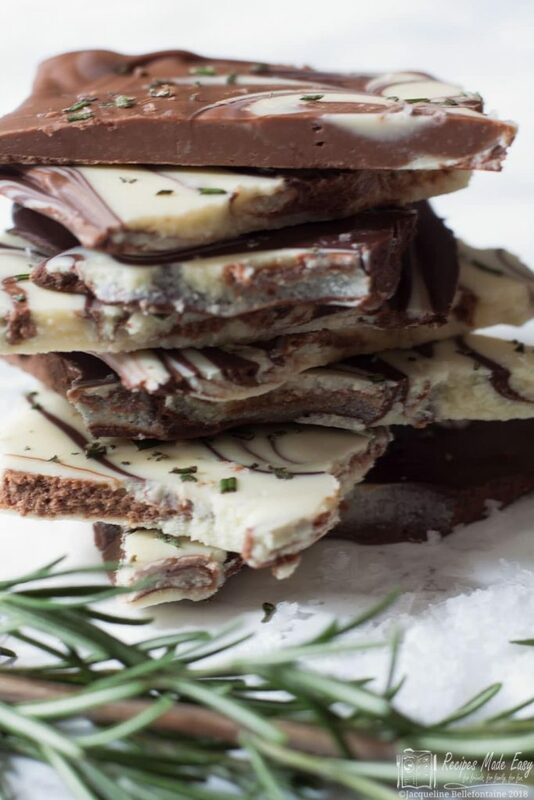 Hi – I made a “trial” batch of these today and they’re delicious! I have a query, though… they were a little “weepy” and stuck together even after tossing in sugar/cornflour twice. Any idea what I may have done wrongly? Apart from that, yummy!! I am delighted you liked the marshmallows but sorry to hear they were a bit weepy. Overly soft and sticky marshmallows can be caused by a variety of factors. The most likely cause is under whipping the mixture should be very thick and leave a trail for several seconds when the beaters are lifted. The bowl should also be cool by this time. Another possibility is that the sugar syrup was not cooked to a high enough temperature, It is worth checking that your thermometer is working correctly. They can vary quite considerably especially cheap thermometers. I highly recommend in investing in a good one as it can help avert disasters when making sweets (and put an end to overcooked meats and other dishes). 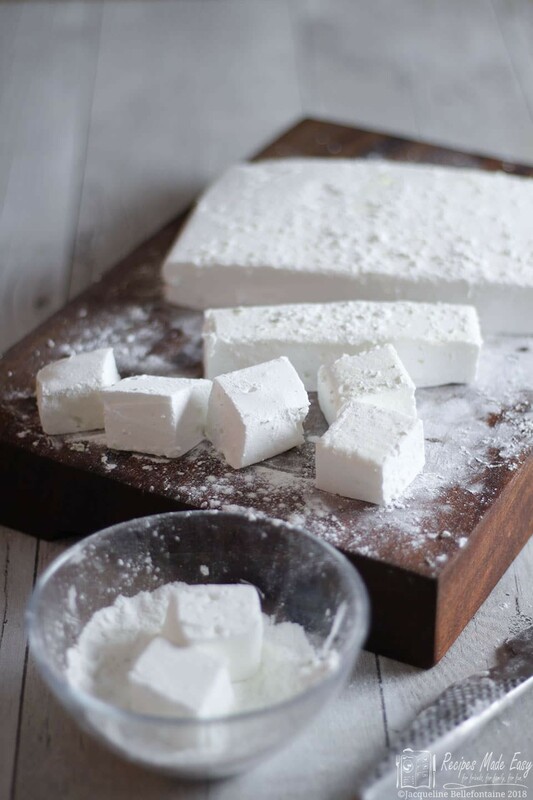 Finally, it could be down to the weather marshmallows are best made on days with low humidity so avoid making them on a humid or stormy day or when the kitchen is very steamy. Make sure you store them in a cool dry place in an airtight container. Brilliant news I like the sound of the Scotch and ginger ale, Im not surprised your friends liked them. I shall have to try them too! Happy New year. When should the gin be added? I can’t seem to find it in the recipe. Thank you for the idea and lesson. I will make it for sure. Just I am not sure what size gelatine to use. I have two sizes. May I ask you to tell in grams? Thank you! Thanks Loreta. I do t have any i the cupboard but will get back to you when I can. Wow, how beautifuly fluffy do they look Jacqui! 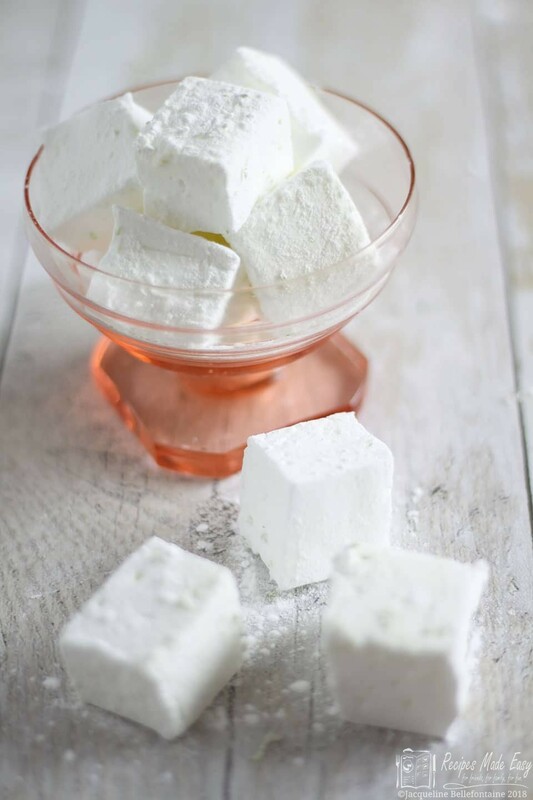 I’ve never made marshmallows before, but over the past few weeks I’ve been wanting to have a go – though I need to think about which vegetarian gelatine replacemet to use and how to incorporate it as vege gels tend to firm up so much quicker than animal based ones. Your marshmallows look amazing Jacqui, I love the idea of a Gin & Tonic flavour. Perfect for a grown up Valentine’s treat. Oh glad I have encouraged you to make it again. It’s quite a subtle gin flavour but you could replace the gin with another favourite spirit or a liqueur although i would probably try it with slightly less. Or omit the gin and just add the juice of the lime for a delicious tangy lime marshmallow. My all time favourite so far was a lime marshmallow with a little raspberry coulis rippled through it, which I did for something sweet.